The pages that follow are reproduced from Carter, D. & Walker, A. K. (1999). 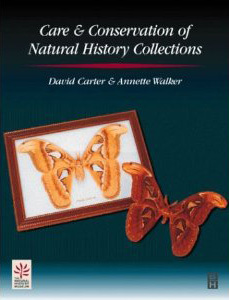 Care and Conservation of Natural History Collections. Oxford: Butterworth Heinemann. with permission from publishers, editors and all contributors. While this text was accurate at the time of publishing (1999), current advice may differ. NatSCA are looking to provide more current guidance and offer these pages as reference materials to be considered alongside other sources. The following pages are the result of optical character recognition and may contain misinterpreted characters. If you do find errors, please email web@natsca.org citing the title of the document and page number; we will do our best to correct them.